The Y is here to help you and your family to become healthier spiritually, mentally and physically. There is no better way to spend time with your family. The Family Wellness Center is located on the second floor just inside the track. It includes a complete set of STRIVE strength training equipment that is designed for children, small adults and those new to exercise. It’s a great place to work out as a family. • Children ages 9-13 must complete an Iron Kids Orientation prior to using. A family wellness coach will be on duty during peak times to complete orientations and assist members. Walk-in orientations may be available, but we strongly recommend that members make an appointment for an Iron Kids orientation at the Service Center in advance. Service fee is payable at the front desk at the time of service. When the fee is paid, please pick up a pass to enter the Child Watch room. For young children our Kid’s Gym is open all year long. The Kid’s Gym is a soft-play area for children age 8 and under while supervised by a parent. 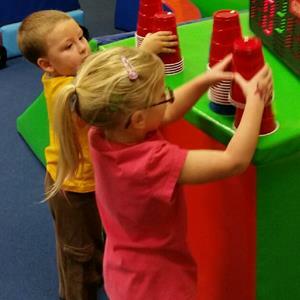 Kids Gym gives kids 18 months to 8 years a place to run, play, explore and socialize. Children must be supervised by a responsible person age 18 and older. Free for Members, paying guests or if you have a complimentary pass. achievement and belonging during before and after school hours. 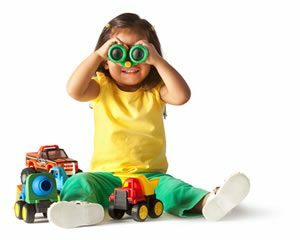 State licensed before and after school child care for boys & girls in grades K through 5. August 23 through May 30 on days when Marion City Schools is in session with the exception of August 30 & 31. SACC and the Y are both closed on August 30 & 31. Benjamin Harrison families should check with your school for an option on August 30 & 31 at BH. Before school care: 6:50 am until MCS bus picks up, arriving at Benjamin Harrison approximately 8:30 am. After school care: Arrival at Y by MCS bus until 6:00 pm. 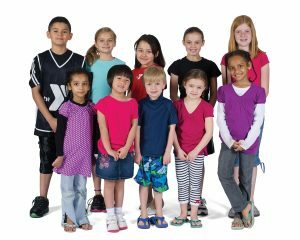 The Y provides separate programs on school vacation days and snow days. At this time, transportation is only arranged to and from Benjamin Harrison Elementary School for children in grades K through 5. Parents with a child attending Pleasant need to complete a babysitting form in their school office indicating the Y as their pick up / drop off location. Currently, Y SACC operates when MCS is in session. Benjamin Harrison (BH) students: transportation from the Y to BH and from BH to the Y is provided by Marion City Schools. Transportation to & from BH is available for students in grades K through 5 only. Program is open to children grades K through 5 in other schools. Parent is responsible for arranging transportation from the Y to school and from school to the Y. 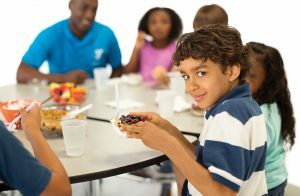 The Y building is in the Pleasant School District; parents in Pleasant need to complete a babysitting form in their school office indicating the Y as their pick up / drop off location. Currently, Y SACC operates when MCS is in session. Fees will pre-adjusted for weeks with less than five scheduled days; all fees are full time with no adjustment for attendance or part-time; fees must be paid the Friday in advance through automatic draft. If opt out of automatic draft, there is an additional $5 fee per child per week. Financial assistance is available for households that demonstrate financial need through the Y’s Membership Discount program. Contact the Y or visit our website marionymca.org. Registration: Registration opens on August 16. Register in person at the Y or online at marionymca.org/register beginning August 16. After initial registration, parents will need to complete all State Licensing enrollment and medical paperwork prior to your child’s first day at the program. More Information:Contact Kaylee King 740-725-9622 or kking@marionfamilyymca.org at the YMCA.To register, stop by the Marion Family YMCA or, click here to register on line. The Y is the place to be when the weather outside is unfriendly and school is called off due to inclememt weather outside. Program runs from 8:00am -5:15pm. Members Only. Participants must bring their own lunch, swimsuit and towel. Contact the Y to confirm availability when school is called off for a Level 1 Weather advisory. The Marion Mentors 21 Program is an organization powered by the collaborative efforts of the Marion Family YMCA, the Marion City Schools, and Nucor Steel. The purpose of the organization is to support the development of one-to-one relationships between a volunteer adult role model and a student. This unique relationship provides support and encouragement, and can help a young person develop the academic, social, personal, and leadership skills to foster success in their future. The MM 21 Program is an effective way to improve the student’s self-esteem, expand their vision of opportunities, and reinforce the Leader In Me concepts presented to every student in the Marion City Schools. MM21 is currently recruiting adult Mentors. Apply online at www.marionmentors.org. By volunteering as a MENTOR you can help a young person develop the academic, social, personal, and leadership skills to foster SUCCESS in their future! Become a MENTOR today! 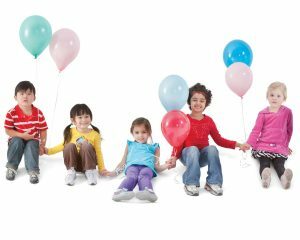 Don’t have enough time to plan a great party for your child? Don’t want to have to worry about a mess? Your birthday boy or girl can play in the pool and gym with their friends and family. Party also includes room set up with table and chairs to open gifts and eat. Parties must be booked two weeks prior to the party date. *Specific pool (8-lane or small pool) use is dependent upon availability of a specific pool at the time and/or day of the party. Call the YMCA at 740-725-9622 to see if your date is available and then stop in to book your party! How can I reserve my date? Stop into the Y and book and pay for your room. May I get into the party room to set up prior to the party? Basic set up ( tables, chairs) will be handled by the Y. You may set up anything else 30 minutes prior to the start of your party. No tape, staples, or tacks may be used on the ceiling, walls, or floor. Inflatables, noodles, or pool toys are permitted. After the party, what am I responsible for? The YMCA staff will clean off the tables and chairs. You are responsible for cleaning up the party area (all trash in trash bins, no decorations left behind) within 15 minutes after the party ends, or will billed $25 cleaning fee. Requests to reschedule must be made at least 2 weeks prior to the event. What if the YMCA needs to cancel the event? Cancellations due to unforeseen events, such as inclement weather, will be rescheduled. If a date can not be agreed upon, the YMCA will refund all payments made by the renter. Please note the YMCA will close the pool during lightning/thunderstorms. It will reopen 20 minutes after last thunder/lightning occurrence. Note: The use of the facility is ONLY for 2 hours of rental. After the party ends, only Marion Family Y members may remain in the building. We also can host bridal and baby showers, after-prom parties, youth after-hours events and lock-ins, baptisms and more! Please contact Heather Wright with questions regarding renting the YMCA for other events.